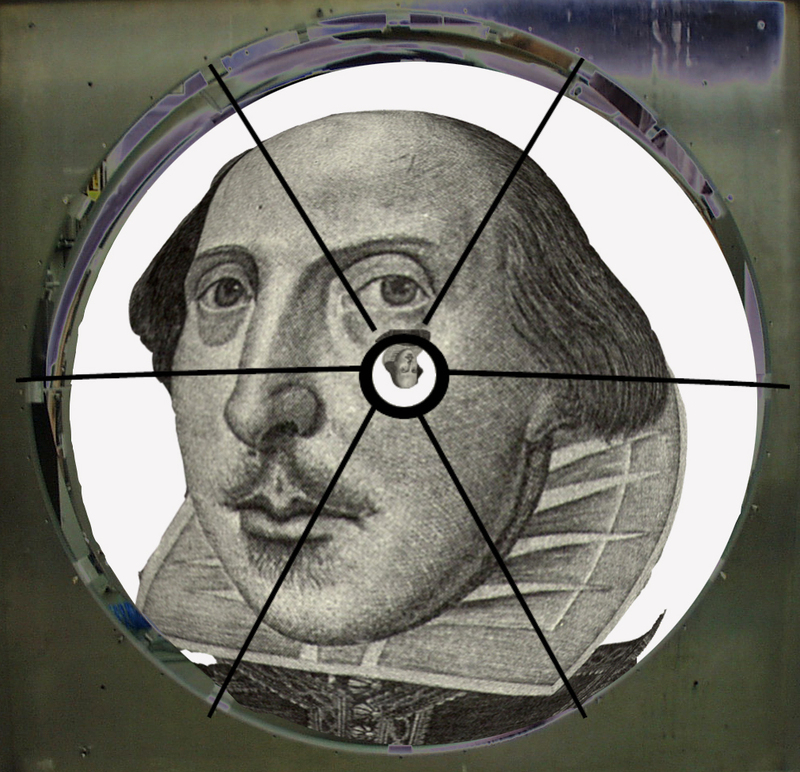 Shakespeare's mirror was technically primitive, yet somehow he could see deep into the truth. Poetry is emotion recollected in tranquility sayeth an old literary giant. An article in the latest Current Directions in Psychological Science takes that a step further and says all of language consists of a respit from emotional control. Two Italian neuroscientists, Leonardo Fogassi and Pier Francesco Ferrari, argue in “Mirror Neurons and the Evolution of Embodied Language” (abstract here) that a central difference between animal cries and human speech is that the cries are under the control of the brain’s emotional circuitry while speech is part of the perceptual (sensori-motor) apparatus. This blog has discussed many traits indicating that speech is not an expansion of animal vocalizations, and the Fogassi-Ferrari piece is further confirmation of the point. Their article goes on to ask, well, if speech is not dependent on the areas that control animal vocalization, what part of the ape brain was adapted to permit speech? or when an individual observes another’s mouth movements, even without hearing any sound. Broca’s area, of course, include functions not found in monkeys. For instance, reading about actions [e.g., “He grasps the glass”] activates Broca’s area. Both the F5 region of monkey brains and human Broca’s area contain “mirror neurons,” i.e., neurons that fire when an individual either performs an action or perceives another perform that same action. There are regions in a monkey’s brain that fire when the monkey performs a hand action or sees another monkey perform a matching hand action. Mirror neurons are particularly important in goal-directed actions. Thus, the same neurons are activated if I perform a task in pursuit of goal Y or if I see another individual act in pursuit of goal Y. Most impressively, if a hand action is identical when pursuing either goal Y or goal Z, my goal Y mirror neurons do not activate if I see you perform that hand action while pursuing goal Z. For this kind of distinction to exist at the neuronal level, the observer monkey must truly understand the reasons another monkey acts as it does. Mirror neurons are critical to making sense of the world. They allow one individual to interpret perceptions in terms of the individuals own experiences. Without this sympathy, responses to the world would be, at best, emotional: sound — fear — flight. With mirrored experience you can have a more measured reaction: sound — recognition — action appropriate to circumstances. In cases where a perception produces a strong emotional reaction — e.g., fear or rage — reflexive brain regions dominate. It is in the less emotionally charged situations that mirror neurons can contribute to understanding and action. Friendly gestures and tone that lower the emotional strength of the moment make understanding more possible. For many generations, people have know this importance of emotional calm, but it is still satisfying to have it explained at the neuronal level. Mirror neurons cannot keep in sympathetic contact with their environment if fearful, angry, or defensive emotions override them. Mirror neurons are also valuable in learning by observing and imitating. This arrangement suggests a possible solution to the mystery of how children manage to reproduce the verbal sounds they hear others make. (I am straying a bit from Fogassi-Ferrari at this point, inserting a bit of my own speculation inspired by reading the article.) Mirror neurons may fire when infants babble, providing a neuronal distinction between the sounds of, say, ma and doh. Then, when a child hears donut, the doh mirror fires, so when the child tries speaking the world it begins with doh. Mirror neurons also make the interchangeability of speaker-listener roles seem perfectly natural. Speaking Pass the salt, please fires the same mirror neurons as listening to the sentence, so, neurologically speaking, the speaker and listener roles have much in common. None of this analysis explains the selective pressures that led to the rise of speech, but it provides a neurological basis for insisting on many of the points that recur on this blog. Speech is fundamentally different in nature and function from animal vocalizations, using different circuits and neuron types. Listening requires a sympathetic relationship with the speaker, a relationship automatically supported by the mirror neurons in Broca’s area. The speaker-listener roles in the communication triangle are fundamentally interchangeable in the natural way that Broca’s area mirror neurons allow. Both speaking and listening are voluntary rather than emotional and follow sensori-motor pathways rather than emotional circuits. If you want to argue, say, that human communications are extensions of animal vocalizations, or that listening does not require sympathy, or that speaking and listening are separate states, or that meaning arises from the symbols rather than the voluntary attentional state, you are going to have to explain how the neurological evidence is irrelevant, misleading, or just plain wrong. Is it possible to think, without the benefit of a language? And what do you think of the Flintstone paradox, as it relates to Chomsky and Pinker's claim that language is innate. "If prehistoric peoples were smart enough to conjugate their verbs and avoid splitting their infinitives, why were they not smart enough to write it all down? Or invent the wheel, or any of a number of things we should expect of a people that sophisticated." For a behavior to be innate, it requires eons of natural selection. Chomsky's theory presupposes that humans living ten thousand years ago were great at grammar, but could do no better than to paint a bison on a cave wall. There is something wrong with that picture, No? First, in response to Tom's comment, I don't think there's any paradox here. At least from my extensive reading of history, often key developments have only occurred a few times, usually when pushed by some particular forces. Most people in the world have adopted technology rather than invented it, and it's only in the past few centuries that what we might call basic human technology has reached just shy of all people in the world. Yet, even today, there are many very intelligent peoples who would never have invented things like the wheel or agriculture were them not introduced to them, unless some environmental change would have forced them to invent them on their own or perish. "If you want to argue, say, that human communications are extensions of animal vocalizations, or that listening does not require sympathy, or that speaking and listening are separate states, or that meaning arises from the symbols rather than the voluntary attentional state, you are going to have to explain how the neurological evidence is irrelevant, misleading, or just plain wrong." But in these cases there's no reason to have to explain that the evidence is irrelevant, misleading, or wrong. I'll demonstrate for one example, the case of listening and speaking being separate states. Here, yes, in this part of the brain we see the same activity. But suppose that in another part of the brain activity differs between listening and speaking in some nontrivial way. In order to rule out that there's is a strong difference between listening and speaking, you have to show that in no other part of the brain can a significant difference be found. Through related arguments you can address all your other arguments. Not that I think you're take on the research has the wrong spirit, I think you just got a little carried away with the details at the end. I see your point Gordon. So if I may continue this line of inquiry: when asked what in particular she thought about -- before being taught language -- Helen Keller made it clear in no uncertain terms that she thought about nothing, other than a few feelings, like sleepiness, or hunger, pain etc. degenerate into little Helen Kellers. They spin just fine, without any guidance whatsoever. 2. Also, given what we know of Helen Keller and others like her, how can Pinker make the case that language does not enable thought? Helen Keller is a poor example because she was deaf and blind, putting her in a catastrophically isolated position. Most animals have more tools available to them for confronting everyday life. There are just too many examples of animals solving problems without the use of language for Tom to make a strong case that without language there is no thought. Tom has burdened himself further by declaring a priori that there can be nothing innate to language, making the usual paradox even more paradoxical. If we had a species that could not think without language and had no innate capacity to produce it, how did these thoughtless individuals ever come up with language? The premise that "language must be taught" is not as absolute as Tom thinks. Although it is true that individual children left to their own devices (e.g., "wolf" children) do not develop language, groups of children forced to fall back on themselves do invent new languages. Creole languages turn out to have been invented by the children and now we have the marvellous example of Nicaraguan sign language, invented by deaf children. 1. It would seem to me that Helen Keller is the perfect example precisely because she “was” deaf and blind. Her deafness and blindness control the experiment, allowing us to attribute her thinking to one and only one variable, language. A reasonable person would conclude from this, that language enables deaf and blind people to think. If language has been proven to dramatically enable thinking in the deaf and blind, then why should it not be capable of doing the same for you? Even if you could answer that question – and I seriously doubt that you could – the fact remains, language has been shown – at least anecdotally -- to profoundly enable thought in the deaf and blind. I just don’t see how you’re going to get out from under that. 2. Let me be more precise. Of course there are certain kinds of thought which do not require language. My dog does a lot of that kind of thinking. I suppose I do it from time to time as well. The type of thought I speak of is the type you used to formulate your last response. My dog could not have done that, nor I without the benefit of language. Surely you are not suggesting that Albert Einstein, if left to the tender mercies of wolves as a newborn, could have emerged from the forest ready to divide four into eight, let alone conceive the theory of relativity. 3. With respect to your suggestion that words can not cause thought because one needs an alpha-thought to cause the word, that’s rather easy to explain: Remember those dog thoughts? It is precisely because we can do some limited thinking without the benefit of words that we can eventually create a word. For instance: Suppose after hearing a series of high pitched grunts whenever the local saber-tooth tiger shows up, you begin to associate those particular vocalizations with danger. There’s your word, and it required no words to create. 4. As for whether language is innate, let me say that everything, to a degree, is innate. So you can never completely lose that argument. My point was that it is not nearly so innate as Pinker would have us believe (as innate as a spider spinning a web) That’s a little far fetched, no? BLOGGER: My point on Helen Keller was that you cannot say that a normal (seeing, hearing) animal cannot think without language by pointing to Helen Keller. She shows you can think with language, but not that visual and/or auditory thinking is unavailable to non-speakers. Anyway, I'm glad to see we got off the initial statement that there is no thinking without language. After that I don't suppose anybody quarrels with the proposition that language helps us think more specifically, clearly, and broadly. Of course, its power to give airy nothing a name also muddles us in ways non-talkers are spared. The question of what is innate is one of the major conundrums for this blog. I'm not much of a Chomskyite/Pinkerite (although we have some excellent commentators who are) and am pretty skeptical of the notion of inborn syntactic modules, but the data makes it quite clear that something is inborn since linguistically-deprived children in a social setting will still produce language, so maybe the spider analogy isn't too terrible. I noticed the silence on the fact that children do not have to learn an existing language in order to develop language. Interesting to see Einstein's name turn up since he denied that language contributed anything to his thinking. Though, probably, if he had been raised by wolves he would not have fared so well. You may have misread my earlier post. Never would I, nor have I claimed anything of the kind. You certainly “can” think without language, as I referred to such thinking as “dog-think.” Perhaps I should refer to it as, “early Helen Keller think.” Either way, it’s not the sort of thinking you are engaged in at this very moment. Fish exist in the sea. (drop the qualifier “in the sea” and you are left with, “Fish exist” -- an equally true statement. -- a true statement, assuming you accept that Ms. Keller was sincere and accurate in her statement. As we agree that she had no dog in this particular hunt, we are obliged to take her observations at face value. Unless you can produce your own Helen Keller type, who, presumably would say that while she was without language, she spent most of her time contemplating Kant’s categorical imperative, then you have little choice but to realign your viewpoint to something more in keeping with my own. Children do not have to learn an existing poem in order to develop poetry, but if your definition of the word “innate” is that vague and imprecise, then I suppose in your view, poetry is also innate. My definition of innateness is a bit more precise than yours and Pinker’s. Might I suggest that what you are referring to as innate, is in actuality, sort of innate?